DOB: 3/10/11 (Twin) Height: 21 1/4"
I've admired Peridot for years and even inquired about putting in a reservation for one of her kids. When Vicki Olson called & said she was selling off her herd, I jumped at the chance to buy Peridot, Priesty, & Casche. This doe is simply one of the most exquisite does I've ever been around---in every single way. She is conformationally almost perfect, has the sweetest personality, and is a dream to milk---with a beautiful udder. The appraiser agreed, giving Peridot a 37 for Rear Udder Height, 38 for Arch, 24 medial, & 35 for Depth. 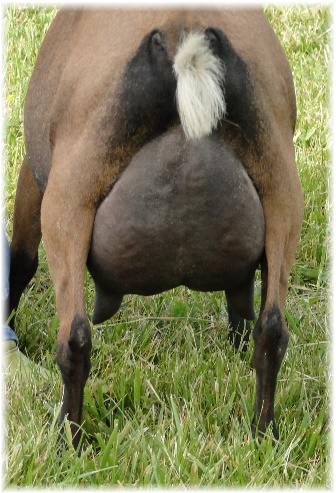 She has wonderful texture, milks out quickly & easily, and milked 6# on her first test, this lactation. Peridot then went on to finish out the remainder of her DHI (305) with a whopping 1392#, moving her into the highest producing doe in our barn. Since we decided to give her a few extra months off---letting her kid in the Fall of 2018---she is still in milk, and currently just passed 1500# (day 343). Side note: On the same trip that the transporter (the wonderful Dianea Fey) delivered the Olson girls, she also was hauling a really nice buckling out of Peridot (Pele's Tears)--who was to become a herd sire for Lisa LoCurto (Fields of Grace). In the same vehicle was one of Vicki's favorite does, Fancy. 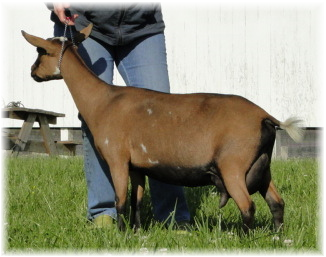 When I started looking for a buck to breed to our Oliver daughters, I noted Lisa had bred Fancy to Pele, I immediately contacted her---the combination of both does is why we purchased Zion. We are very, very blessed and most grateful to Vicki for allowing us to have these lovely does.